in service with its air force. one year of a contract signature. Gripen NG and Sukhoi Su-30/35. far modified for $106 million. will cost another $400 million. en servicio con la fuerza aérea. un año de la firma del contrato. Gripen NG y Sukhoi Su-30/35. muy modificado por $ 106 millones. costará otros $ 400 millones. A couple of weeks ago, an experienced Eurofighter Typhoon industry test pilot, wrote to The Aviationist to reply to a Lockheed F-35 test pilot who, talking to Flight’s Dave Majumdar had claimed that all three variants of the Joint Strike Fighter will have better kinematic performance than any fourth-generation fighter plane with combat payload, including the Eurofighter Typhoon. Now the same Typhoon pilot has once again chosen this blog (and I’m honored for this) to explain why thrust vectoring, considered one of the most important F-22 features, is not essential when you are involved in an air-to-air engagement WVR (Within Visual Range). RAF Typhoons and U.S. Air Force F-22s are currently operating together in the U.S.: the joint mission started with a training exercise called Western Zephyr and will continue next week at the Red Flag 13-3 at Nellis Air Force Base. As reported in an interesting Defensenews article, the agility of the American 5th generation fighter plane is among the things that impressed British pilots the most. Even if it is a matter of fact that the European top class fighter jet lacks thrust vectoring (TV) our source believes that this is not a big deal. To be honest, the points he raises were already discussed in the article about the outcome of the dogfights between the U.S. Air Force F-22 Raptors and the German Air Force Eurofighter Typhoons during last year’s Red Flag – Alaska, when Americans said the F-22 performance was “overwhelming” while German said the costly stealth fighter was “salad” for the Eurofighter’s pilots lunch. At that time we said that the F-22 tends to lose too much energy when using TV and unless the Raptor can manage to immediately get in the proper position to score a kill, the energy it loses makes it quite vulnerable. couple of weeks ago, an experienced Eurofighter Typhoon industry test pilot, wrote to The Aviationist to reply to a Lockheed F-35 test pilot who, talking to Flight¡¯s Dave Majumdar had claimed that all three variants of the Joint Strike Fighter will have better kinematic performance than any fourth-generation fighter plane with combat payload, including the Eurofighter Typhoon. Now the same Typhoon pilot has once again chosen this blog (and I¡¯m honored for this) to explain why thrust vectoring, considered one of the most important F-22 features, is not essential when you are involved in an air-to-air engagement WVR (Within Visual Range). To be honest, the points he raises were already discussed in the article about the outcome of the dogfights between the U.S. Air Force F-22 Raptors and the German Air Force Eurofighter Typhoons during last year¡¯s Red Flag ¨C Alaska, when Americans said the F-22 performance was ¡°overwhelming¡± while German said the costly stealth fighter was ¡°salad¡± for the Eurofighter¡¯s pilots lunch. We have all been around long enough to recognize there is not a single sensor able to turn the night into day, nor a unique aerodynamic design feature capable of ensuring by itself air dominance if implemented. The effectiveness of an air superiority fighter relies on the successful combination of a range of design elements including thrust-to-weight ratio, wing loading, avionics and weapons integration. Furthermore, : appropriate tactics and valuable aircrew training must be developed to exploit the full potential of the weapon system. Thrust Vectoring is one of the design elements that can contribute to create a certain advantage during close air combat by generating impressive pitch and yaw rates, but only in a limited portion of the flight envelope at velocities well below ¡°corner speed¡±. However, Thrust Vectoring can also transform in a few seconds an energy fighter in a piece of metal literally falling off the sky, making it an easy prey for those who have been able to conserve their energy. Moreover, Thrust Vector operation requires the pilot to ¡°create the opportunity¡± for its usage, spending valuable time in manoeuvring the aircraft to achieve a suitable condition and managing the activation of the Thrust Vector Control. If you are ¡°defensive¡± and your aircraft has Thrust Vectoring, you can possibly outturn your enemy, but that most likely won¡¯t prove to be a great idea: an energy fighter like the Typhoon will conveniently ¡°use the vertical¡± to retain energy and aggressively reposition for a missile or gun shot. Also the subsequent acceleration will be extremely time (and fuel) consuming, giving your opponent the opportunity to tail chase you for ever, exploiting all its short range weapon array. If you are ¡°neutral¡±, when typically vertical, rolling and flat scissors would accompany the progressive energy decay, similarly performing machines would remain closely entangled, negating the opportunity for Thrust Vector activation. If you are ¡°offensive¡±, probably stuck in a never ending ¡°rate fight¡±, Thrust Vector could provide the opportunity for a couple of shots in close sequence. Make sure nobody is coming to you from the ¡°support structure¡±, otherwise that could be also your last move. Talking of twin tailed aircraft, Angles of Attack in excess of 30-35 degrees are capable of creating drag conditions unsustainable no matter the engine/airframe matching, and developing energy decays intrusive of the tactical flying but also of the flight control system protections. Roll rates would also deteriorate at the higher values of AoA and target tracking ability would quickly decay. Eurofighter has decided to develop for the Typhoon High Off-Bore-Sight Weapons, supported by Helmet Cueing, to retain energy and target tracking ability while manoeuvring WVR (Within Visual Range) at relatively high but sustainable Angles of Attack. For those who may require some additional AoA, the ¡°Strakes¡± package is progressing well and soon it will be offered to Typhoon¡¯s Customers. Nevertheless, Strakes is not purely about extreme AoA, but also suitable Roll Rates and manageble energy characteristics. Because in the European way of doing things, an all round balanced solution counts more than a single eye opening performance. It is a fact that against Eastern produced fighters provided with Thrust Vectoring, throughout the years the Typhoon has showed an embarasing (for them) kill-to-loss ratio. It is a fact that after some initial encounters between the Raptor and the Typhoon, the situation appears of absolute equity. Too early to say if it is the Helmet Cueing or the Thrust Vector, or how much tactics and training are a player in all this. For sure, we are facing two impressively capable machines. Even if this can be true, the risk of coming to close range is still high. 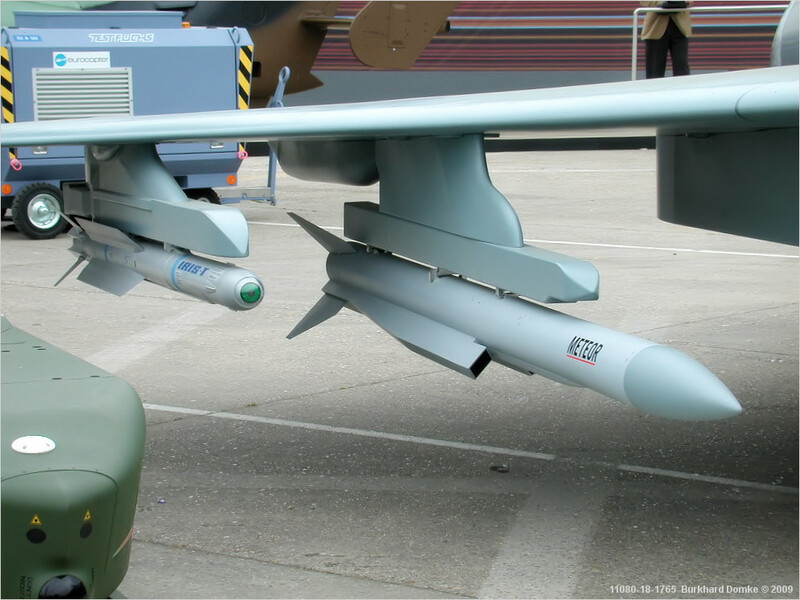 At a distance of about 50 km the Typhoon IRST (Infra-Red Search and Track) system could be capable to find even a stealthy plane ¡°especially if it is large and hot, like the F-22¡å as a Eurofighter pilot once said. Furthermore, Raptors are not always stealthy as one might believe: for instance, when they carry external store, rejoin with tankers or talk on the radio (secure or unsecure ones) they become more vulnerable to detection. Interesante pero que tiene que ver con la posible adquisicion del typhoon? Por eso es que no leo mas este foro. No encuentro nada de noticias a cerca de la FAP. Me voy. aparentemente no es possible o su costo increiblemente alto por eso es que estan vendiendolos. La capacidad del Typhoon tranche 1 es limitada a AA y limitada AG. Me imagino que generalmente serian usados en la mision de superioridad aerea por la FAP. Ahora formulate la pregunta de otra manera. Teniendo todo el dinero necesario disponible...¿USA te venderá un F-22 de ultimo nivel, un F-35 "patanegra" stealth para aliados o un F-18E al ultimo grito de chiches?...piensa que lo "ultimo" que el congreso USA ha autorizado a venderles ha sido un conjunto Sea Sparrow MK57 MOD 10 tecnología de los años 90 para la MGP, ni tan siquiera ESSM....no recuerdo nada "state of art" en armamento ni tecnología que USA haya vendido al Perú, pero puedo estar equivocado. La cuestión, según yo lo veo que puedo estar errado es...Europa es cara, pero te va a vender cualquier cosa que puedas pagar, ¿USA va ha hacer lo mismo?. Con los Eurofighter, si tienes el suficiente dinero puedes adquirir los mismos misiles Iris-T, BVR Meteor o Stand Off Taurus KEPD de la Luftwaffe o el EdA, incluso el ALARM de la RAF...¿USA te venderá misiles del mismo block que los suyos?...el Slammer C-8 lo tienen en inventario desde hace 5 años, de momento venden el block C-7 a los amigos, ¿me explico? Después, pensar en un Eurofighter en el ámbito de coste de T1, T2 o T3, incluso de F-18E en coste unitario es pueril, pues hay que pensar en el coste de ciclo de vida y armamento asociado....que fácilmente suba al triple la inversión, ¿puede la FAP soportar ese nivel de inversión?. Quiero decir que, con Eurofighter, teniendo y gastando mucho dinero puedes estar al mismo nivel tecnológico que la RAF, la Luftwaffe o cualquier FA europea que lo posea, mientras que comprando en USA, jamas, por mucho dinero que tengas y gastes, estarás al mismo nivel tecnológico de la USAF. Por ultimo, no importa que hablemos de F-18E o Eurofighter T1 españoles con 600 horas, ninguno Flyaway con chiches y repuestos te va a salir por menos de 120 millones unidad....¿no te conformarías con F-16?, si...perfecto, en el mundo hay a cienes y baratos, ¿no?...¿porque?. El nivel de operatividad del que disfrutan las flotas de aeronaves de los distintos países es muy pelegrina y cambiante, esta varia en función de la edad de la flota, su nivel de mantenimiento, su grado de integración como SdA dentro de la FA y si la flota esta recibiendo upgrades, pero, se estima que en una FA “normal” un nivel operativo de 2/3 es aceptable, el 1/3 restante estaría en revisiones post vuelo, revisiones periódicas programadas o reparación de averías puntuales. Esto nos da que de los 10 Block 50 chilenos contaremos con 7, y de los 36 MLU contaremos con 24. Una ventaja fundamental de la FACh respecto a la FAP es el AWACS, obviemos que es solo uno y muy viejo por lo que se puede afirmar que la FACh solo tiene cobertura AWACS parcial (no tiene capacidad 24/7). Los block 50 seguramente estarán reservados para misiones de deep attack y los F-5E como defensa aérea cerca de sus bases…tenemos que el Condor/Phalcon ha salido a pasear, junto a el 4 F-16, que para darles sopa se destaca un KC-135 con otros 2 sedientos F-16 mas otros 2 en “stand by”. Ahí, en una simple misión de control aéreo diario y rutinario estamos utilizando el 100% de la fuerza AWACS, el 33% de la fuerza de cisternas y el 33% de los F-16 MLU. Aun quedan 16 posibles MLU operativos disponibles para CAP y controlar el campo de batalla. Esta claro que el nivel de atriccion del Condor impedirá que lo utilicen muchos días seguidos y que los KC-135, que tampoco son niños también caerá con el paso de los días, pero sus números de MLU le otorgan un plus muy importante para dominar la superioridad aérea. No encuentro nada de noticias de un Cerca de la FAP. Me voy. A ver... aunque es cierto lo que Incomming dice, tambien es cierto que aca en el Peru... no vamos a decir que estamos mision imposible, pero tampoco estamos para gastar excesos. Porque no solo serian 120 millones por aparato, a eso hay que sumarle mto, alguno que otro chiche extra q necesitemos, muchas cosas. Por eso, yo veo francamente muy dificil que dicha transaccion se lleve a cabo. Personalmente me iria hacia el Grippen NG, que es mas comodo y tambien me da muchisimas capacidades (y AESA).